One thing that you learn from talking to your children is that oftentimes you’re not nearly as interesting as you think you are… What can I do but take these painfully learnt lessons and apply them in the classroom? So in recognition of how boring I can be and to break things up a bit, I like to bring in TV and films to help contextualise or liven up what I’m talking about. I’ve used clips from the greatest TV show ever made (Total Wipeout USA) to explain anatomy and bodily movement; I’ve set quizzes about muscles using Strictly dances; Game of Thrones is perfect for those sessions where you are describing how to identify trauma on the body; and then there’s Star Wars. I’m of an age where I grew up with the original trilogy. It infused my childhood. I watched the films repeatedly and acted out adventures on our sofa with the figures (which I am alarmed to see referred to on eBay as vintage…). I also (because I was a big ol’ geek and not yet the smart, sophisticated and witty intellectual you see before you now) played the board games with my friends at school. I still remember going with my friends from my MSc course, skipping out of lessons, to get to the first showing of The Phantom Menace when it was released. Which considering the film effectively shat on my childhood, was ultimately unnecessary. And now that I have two small boys, I can introduce the films to them, play around with them (I am always Han…) and spend quality time explaining to them that they are absolutely wrong about Jar Jar Binks and that he is, in fact, a stain on humanity. At the moment they like Return of the Jedi the best, but they’re young and stupid, and I wait for the time that they realise it’s Empire. We all loved The Force Awakens (although I was frustrated that my children did not view the sight of a son stabbing their father through the chest as negatively as I did…) and The Last Jedi was a delightfully surprising breath of fresh air. They didn’t really like Rogue One, but I did. One of the things I like about Rogue One is the moral haziness it presents. Unlike the other Star Wars films, where the good guys and the bad guys are pretty obvious, Rogue One shows that in most cases, it’s a lot more complicated. Which makes it ideal for use in my teaching sessions. One of the things I discuss with our students is the role of forensic science in the investigation of contexts of mass violence, and particularly war crimes / crimes against humanity. It’s a fascinating subject, and one I love to get my teeth into and really challenge the students with. But before we can explore the input of forensic practitioners, we need to talk about the wider context. We go through the definitions and touch upon some of the history. We even explore the ICC a little bit too. But it’s all quite abstract for students who tend to be more technically-minded like mine. Hence Rogue One. One of our slides setting the scene. What we focus on is the sense of individual culpability in the context of international (or in this case, interplanetary) conflict. 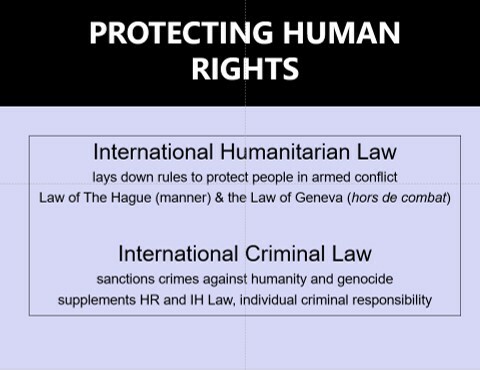 We also draw in discussion on moral decision-making and then relate all of this to the current international humanitarian and criminal legislation. By focusing on the actions and backstories of these half a dozen or so characters, it allows us to talk through first what we think is acceptable and understandable, and then second what we think is legal or otherwise. Thinking about what is right and wrong. 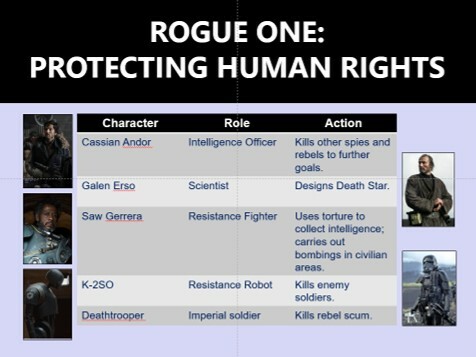 Is, for example, Galen Erso guilty of crimes against humanity for designing the Death Star? How does the fact that the lives of his family were threatened affect this? Is it ever acceptable to use torture in order to collect intelligence which may save the lives of thousands? Where do we fall on the continuum between individualism and collectivism? Of course, this session works best if the students have actually seen the film. Thankfully when it comes to Star Wars, there will always be students in the class who are familiar with enough of the detail and story lines to make this work. Knowing the history and motivations of these characters, unlike in the many real-world contexts, makes it easier to discuss the interesting issues. I reckon our discussions went on for about half an hour this time, as we brought in themes and talking points from earlier in the session. I said in my previous post that it’s important to foster a higher education experience that resonates with our students’ lived experiences. Sometimes Star Wars may be that experience. I'm a Professor of Applied Biological Anthropology at Teesside University.